It is important that all of us, no matter our age or where we are on our faith journey, be educated in the faith and spiritually nourished. Annunciation Parish offers different programs throughout the year to assist youth and adults in their lifelong journey of growing in holiness. RCIA: The Rite of Christian Initiation of Adults (RCIA) provides adults with the opportunity to explore the Catholic faith and its teachings. Through participation in the RCIA process, adults may come to the desire to receive the sacraments of Initiation (i.e. Baptism, Eucharist and Confirmation) and commit themselves (or re-commit themselves in the case of those who once began the journey but for some reason it was interrupted) to the Catholic faith. While the RCIA is focused on the conversion of the individual and their personal faith journey, the RCIA process also renews the entire parish community through the shared experience of growing in faith. 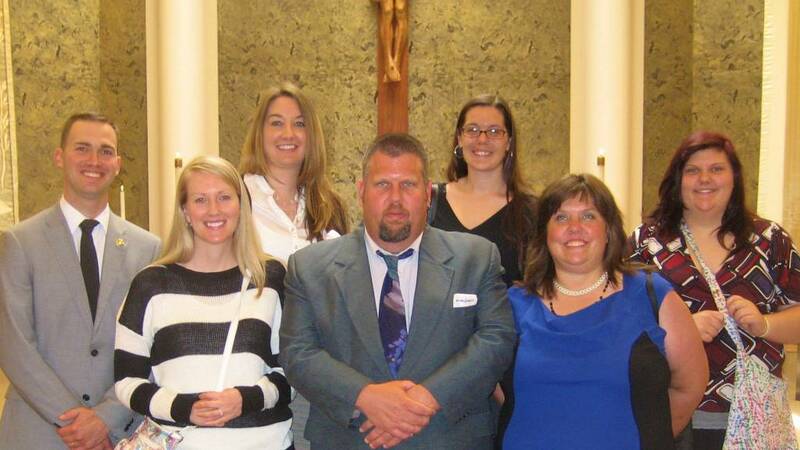 The RCIA program at Annunciation Parish starts each year in September. The sessions meet each Sunday in the Parish Center. If you are interested, please contact Mike Vogel, RCIA Coordinator, through our Parish Office, 812/476-3061. Adult Faith Formation and Continuing Religious Education: Throughout the year, Annunciation Parish offers a variety of educational and spiritual opportunities to enrich the faith lives of adults in our parish. We encourage you to see our bulletin for up-to-date offerings. There are also many opportunities for faith formation offered by the Diocese of Evansville and nearby St. Meinrad Archabbey & School of Theology, and Monastery Immaculate Conception in Ferdinand, Indiana. For more information on any of these programs, please call the Parish Office at 812/476-3061. School Based Religious Education: The children who attend Annunciation Catholic School at the Christ the King and Holy Spirit campuses receive ongoing religious education in the Catholic faith tradition, as well as sacramental preparation. For more information about our school, please call the Parish Office, 812/476-3061. Catechesis of the Good Shepherd: September through May, Annunciation Parish will offer Catechesis of the Good Shepherd. Catechesis of the Good Shepherd is about initiating children ages 3-12 into the covenant relationship with God, helping them to receive and respond to the loving call of Jesus the Good Shepherd. Initially, CGS will be offered Wednesday mornings on the Holy Spirit campus. If there is interest, we will add another meeting time. Please call Julie Rosario in the parish office for more information, 812/476-3061. To learn more about CGS, visit http://cgsusa.org.